Last night, pianist Peter Donohoe joined CUCO for our first rehearsal of Shostakovich’s Piano Concerto no. 2 in F and Mozart’s Piano Concerto no. 20 in D minor. We’re performing these pieces, together with Mozart’s Symphony no. 25 in G minor, without a conductor. Playing in a conductorless orchestra is hugely exciting. For me, the experience is closer to playing in a string quartet than in a full symphony orchestra: every player is listening intently to their colleagues, and responding dynamically and sympathetically to any musical gesture that is suggested by another player or section. There’s also a lot of eye contact, and it’s refreshing to look around at different sections of the orchestra (especially the winds and brass), rather than feeling you have to have your eyes glued to the conductor. Ultimately, though, the most exciting thing is the completely liberated sound of the orchestra. I’ve rarely heard CUCO sound so fine, and I think it’s due to the individual responsibility people are taking to shape the music as carefully and intelligently as they can. We’re playing as a unified team of soloists, and it’s making the music come alive. Each concerto poses quite different challenges. The Shostakovich concerto needs razor-sharp precision in the outer movements to convey the highly rhythmical writing, and a feeling of intense grief in the slow movement, which features one of the most sorrowful and passionate melodies in the orchestral literature. The Mozart concerto certainly requires the same precision, but the individual lines are more undulating and complex, and the textures aren’t centred on the piano in quite the same way as they are in the Shostakovich. There is an inexorable flow in the music – it’s one of Mozart’s darkest works, and there needs to be enough weight in the orchestral sound without it sounding thick and sluggish. We haven’t rehearsed the Mozart symphony yet, but it’s a fantastic piece with plenty of musical substance. It’s an early work of Mozart: he wrote it when he was just seventeen, while the concerto was written nearer the end of the composer’s life. While one might associate young Mozart with prodigal brilliance and boundless elation, that’s not quite the case in this symphony. 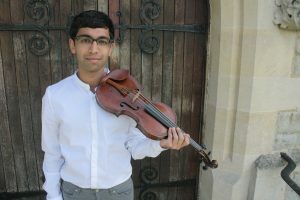 The key of G minor is often linked with tragedy in Mozart’s output and, despite the virtuosity of the outer movements in particular, the Symphony no. 25 is no exception. The chromatic lines and plaintive oboe melodies of the first movement and the closely-voiced sonorities of the second movement, with its melodic bassoon lines and muted strings, give a different impression of the young composer. Perhaps he was influenced by the Sturm und Drang movement of the early classical period: the moods change rapidly, and the fiery textures of the inner string parts suggest a prevailing drama. But, more than that, this symphony could be seen to prefigure some of the more tragic works from Mozart’s later period, such as the Requiem in D minor, the Adagio and Fugue in C minor, and the Piano Concerto no. 20 in D minor which we are also performing. Indeed, the links to the concerto are more than just in mood: both pieces start with a syncopated string texture and a rising sequence; both have slow movements in the submediant major (E-flat major in the symphony and B-flat major in the concerto); and both have brisk finales with fast harmonic changes. I can’t wait to present this programme to you with CUCO on 4 March at West Road Concert Hall. 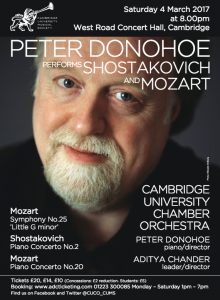 You’d be hard-pressed to hear a finer student orchestra in Cambridge, and Peter Donohoe said himself that even the first rehearsal was better than he’d heard many professional orchestras in concert. Book now to avoid disappointment, and see you there!